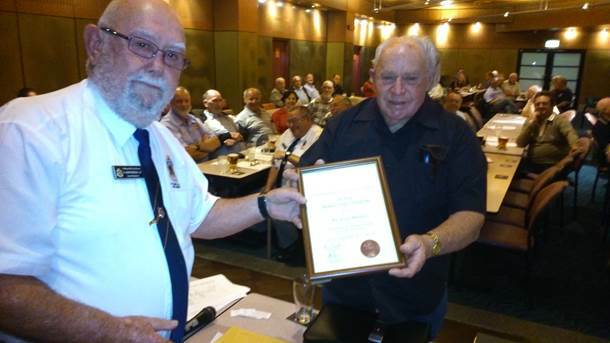 Ray Radford was presented with his 50-year membership award at the Sub-Branch’s September General Meeting. Ninety members present gave Ray a warm acclamation for such a fine achievement. Congratulations Ray. Photo shows Vice President john Foeken making the presentation to Ray. We are a proud RSL Sub-Branch to be able to reveal that our long-serving member, Tom Paine, has now been awarded Life Membership of the RSL. Tom, who now resides in Brisbane, put endless time and effort into promoting the advancement of the St Marys Sub-Branch. He was a key contributor (if not initiator) in many worthwhile activities and events within the Sub-Branch. Being an active member of the Memorial Fund Committee and during that time proposed that the Memorial Fund donate to School Libraries. He then set up the biennial presentation of cheques to each of up to 30 schools in the St Marys district. He held the position of Trustee of the St Marys Sub-Branch for many years where he was influential in effective management of the Sub-Branch’s finances, and was heavily involved in setting up the Sub-Branch’s investments when the funds were received from the sale of St Marys RSL Club. He was instrumental with Col Shepherd in setting up and the initial running of the much revered Colin Shepherd OAM Memorial School Scholarship program which has now continued in high demand by Year 10 students in the six participating schools for more than ten years. He was instrumental in establishing the Governor King Day Club where he also operated as Co-ordinator for the initial three years; this Day Club still operates today to bring enjoyment, entertainment and relevant information to many elderly within the St Marys district. A delegation from the Sub-Branch (including Vice-President John Foeken, Treasurer Ted Fish and current Co-ordinator of the Governor King Day Club, Wal Charlwood) paid a surprise visit to Tom in Brisbane on Wednesday 7th August 2013, to present him with the award. We thank Tom for all his dedication and hard work for the Sub-Branch members; we congratulate him on being bestowed with Life Membership of the RSL; and we wish him and his lovely wife, Maureen, well in their new abode in Queensland.